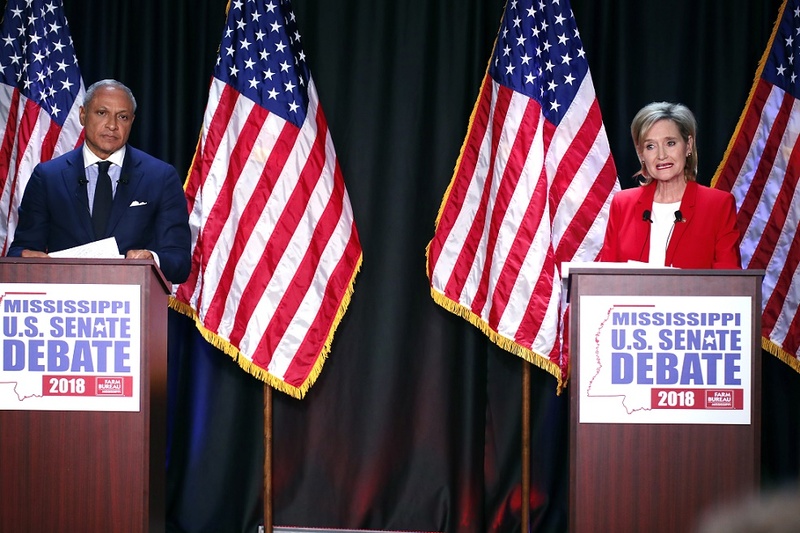 Hyde-Smith spoke at the Mississippi Coast Coliseum in Biloxi, hours before polls opened in the final midterm contest in the country, a runoff against former congressman and secretary of agriculture Mike Espy. Mississippi has not elected a Democrat to the U.S. Senate since 1982 and has never elected a black senator since the Reconstruction Era after the Civil War. “If he invited me to a public hanging, I’d be on the front row,” Hyde-Smith told a crowd about a political supporter. Thirty-eight percent of Mississippi’s registered voters are black. She apologized in a carefully worded statement “to anyone that was offended.” But photos posted to her Facebook account in 2014 showed her smiling with Confederate items, and reports that she attended a segregated academy in high school did not help her campaign move past the uproar. Espy spent election eve at a get-out-the-vote “Gospel explosion” in Jackson. His campaign has been lifted in recent weeks by prominent Democratic figures and national fundraising groups pumping last-minute enthusiasm and cash into the tighter than expected race. Espy, 64, spent the campaign’s final days blasting Hyde-Smith’s controversial comments as “despicable” and said she would be “a disaster for Mississippi’s economy.” He pointed to decisions from companies including AT&T, Major League Baseball and Wal-Mart, all of which denounced her recent statements and asked for their campaign donations back. In her eight months in the U.S. Senate, Hyde-Smith has emerged as a fierce loyalist of Trump. She voted in favor of his policies 100 percent of the time, according to FiveThirtyEight, which tracks congressional votes. “The message we want voters to have is that Cindy Hyde-Smith is going to represent Mississippi’s conservative values. She supports President Trump’s agenda, is pro-Second Amendment, pro-life and is in favor of border security,” a campaign spokeswoman said. Republicans retained control of the Senate on Nov. 6, with Democrats losing close races in Florida, Texas and Tennessee. Democratic Senator Doug Jones won his Senate seat in neighboring Alabama last year after sexual misconduct allegations sank Roy Moore’s campaign. Republicans hold a 52-to-47 seat edge in the Senate. Both Hyde-Smith and Espy received about 41 percent of the vote in the special election this month.